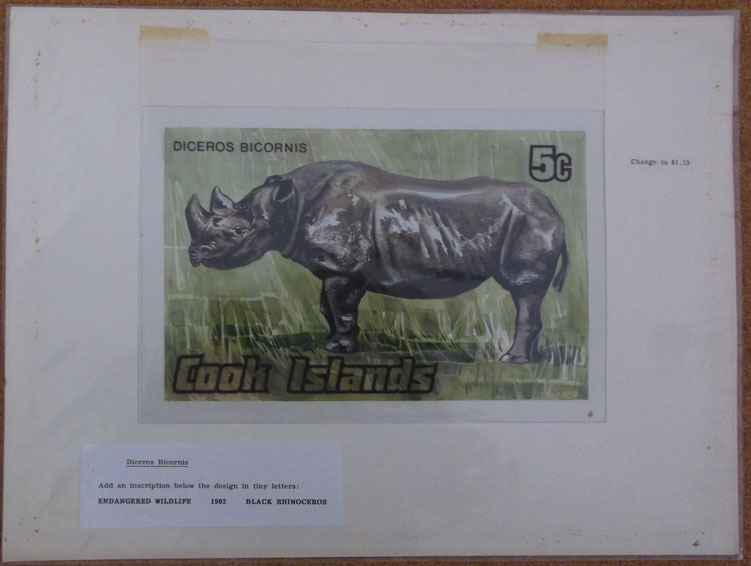 6052 MAQ COOK ISLANDS (1992) Black rhinoceros (Diceros bicornis). Original artwork, watercolor mounted on posterboard with mylar overlay for lettering. Design measures 24 x 15 cm (windowed on board 40 x 30 cm). Scott No 1098. 6053 MAQ COOK ISLANDS (1992) Chimpanzees (Pan satyrus). Original artwork, watercolor mounted on posterboard with mylar overlay for lettering. Design measures 24 x 15 cm (windowed on board 40 x 30 cm). Scott No 1099. 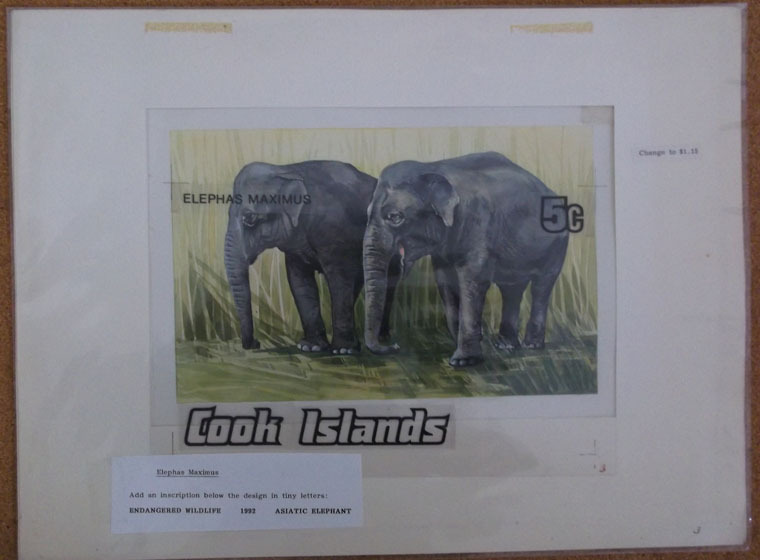 6089 MAQ COOK ISLANDS (1992) Asiatic elephant (Elephas maximus). Original artwork, watercolor mounted on posterboard with mylar overlay for lettering. Design measures 24 x 15 cm (windowed on board 40 x 30 cm). Scott No 1096. 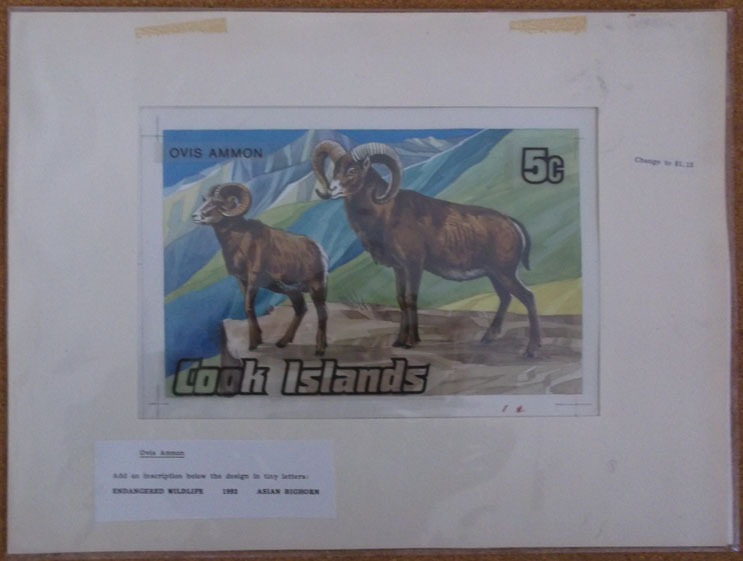 6115 MAQ COOK ISLANDS (1992) Bighorn sheep (Ovis ammon). Original artwork, watercolor mounted on posterboard with mylar overlay for lettering. Design measures 24 x 15 cm (windowed on board 40 x 30 cm). Scott No 1100. 6805 MAQ COOK ISLANDS (1997) Red Admiral (Vanessa atalanta). 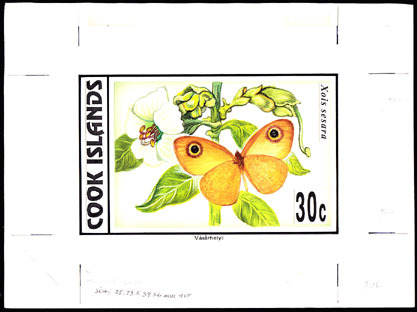 Original artwork by Julian Vasarhelyi, who designed many stamps of the Cook Islands. Watercolor mounted on posterboard with mylar overlay for lettering. Design measures 14.5 x 9 cm (mounted on board 23x 17 cm). Scott No 1216. 6807 MAQ COOK ISLANDS (1997) Dark Blue Tiger (Danaus Hamata). 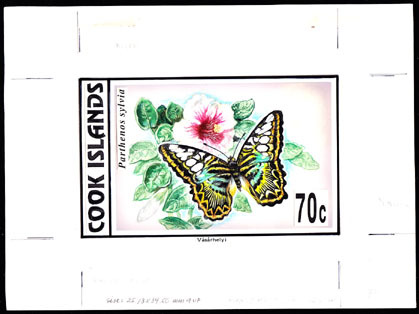 Original artwork by Julian Vasarhelyi, who designed many stamps of the Cook Islands. Watercolor mounted on posterboard with mylar overlay for lettering. Design measures 14.5 x 9 cm (mounted on board 23x 17 cm). Scott No 1219. 6808 MAQ COOK ISLANDS (1997) Common Fijian Ringlet (Xois sesara). 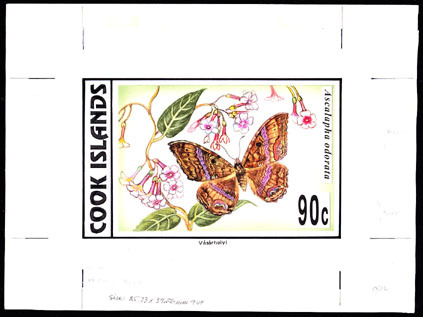 Original artwork by Julian Vasarhelyi, who designed many stamps of the Cook Islands. Watercolor mounted on posterboard with mylar overlay for lettering. Design measures 14.5 x 9 cm (mounted on board 23x 17 cm). Scott No 1220. 6809 MAQ COOK ISLANDS (1997) Clipper (Parthenos sylvia). 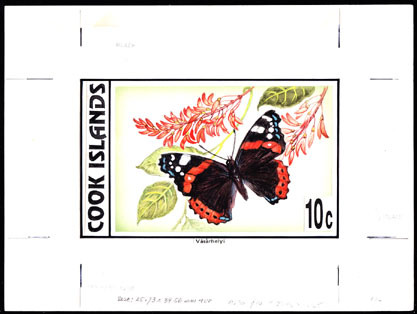 Original artwork by Julian Vasarhelyi, who designed many stamps of the Cook Islands. Watercolor mounted on posterboard with mylar overlay for lettering. Design measures 14.5 x 9 cm (mounted on board 23x 17 cm). Scott No 1222. 6810 MAQ COOK ISLANDS (1997) Hyblaea sanguinea. 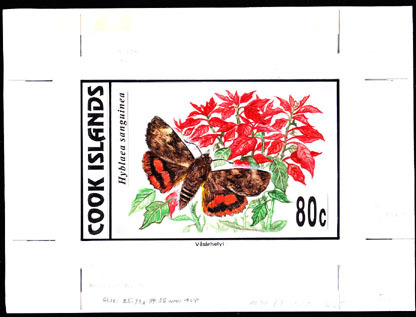 Original artwork by Julian Vasarhelyi, who designed many stamps of the Cook Islands. Watercolor mounted on posterboard with mylar overlay for lettering. Design measures 14.5 x 9 cm (mounted on board 23x 17 cm). Scott No 1223. 6811 MAQ COOK ISLANDS (1997) Black Witch (Ascalapha odorata). 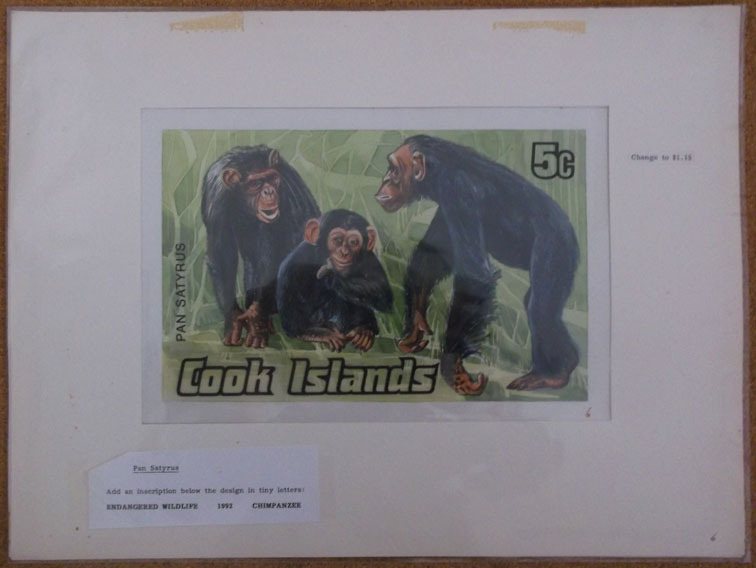 Original artwork by Julian Vasarhelyi, who designed many stamps of the Cook Islands. Watercolor mounted on posterboard with mylar overlay for lettering. Design measures 14.5 x 9 cm (mounted on board 23x 17 cm). Scott No 1225. 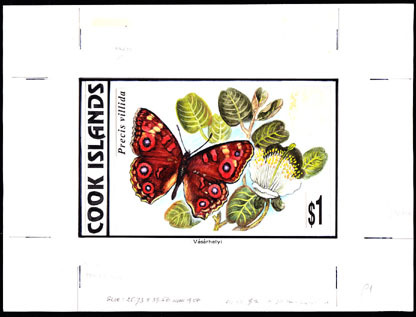 6812 MAQ COOK ISLANDS (1997) Meadow Argus Precis villida). 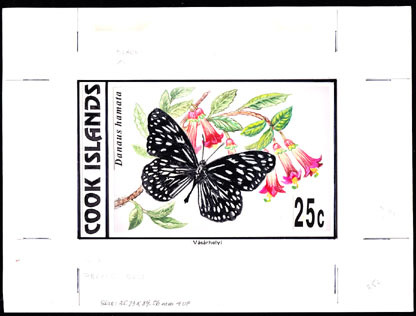 Original artwork by Julian Vasarhelyi, who designed many stamps of the Cook Islands. Watercolor mounted on posterboard with mylar overlay for lettering. Design measures 14.5 x 9 cm (mounted on board 23x 17 cm). Scott No 1226.